Report by Christopher J Cooper. Click on images to enlarge. The Tower Captain of Nutfield, Alan Streeter, delivers the first eulogy to Mr Burkin. The Master delivered the second. 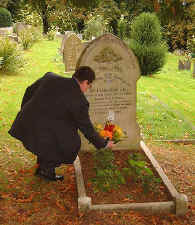 After the Rector had said a few prayers, the Master places a wreath upon Mr Burkin's grave. 1-2 Colin Newman (C), 3-4 Dickon Love, 5-6 Richard Verrall, 7-8 Michael Moreton. 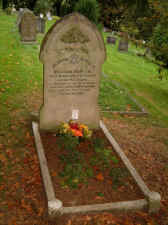 Click on image for a finer resolution of the gravestone. The shaking hands may indicate an angel welcoming Mr Burkin to heaven, as the Rector pointed out, with a masonic handshake, Villagers gather outside the church prior to the peal attempt. 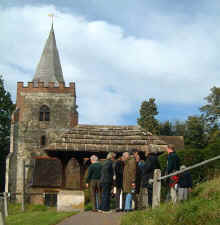 They went on a village ramble during the ringing. The peal was unfortunately lost just over halfway through. 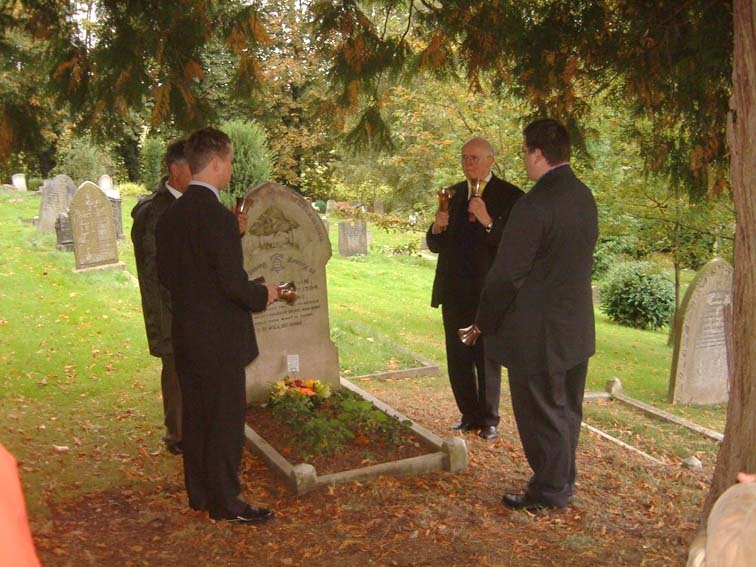 The Ancient Society of College Youths had the pleasure of visiting the parish of Nutfield on Saturday October 9th to do homage to one of its esteemed past Masters. Mr William Burkin, Master 1896  7 was a mainstay of Nutfield church, and of the local community in the latter part of the 19th century, and a gifted ringer, who held the Office of ASCY Master through some turbulent times. The Master and five members of the Society converged on the parish of Nutfield, with the intention of celebrating the life of Mr Burkin, the centenary of whose death occurs this year. 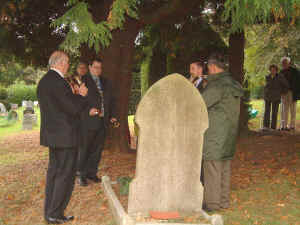 The current Master gave a speech at Mr Burkins grave, followed by a touch on handbells, lunch, and then a peal attempt, concluding the proceedings with tea. Negotiating the way to Nutfield should not have been a particularly arduous task  though for some, what with railway engineering works, the journey was somewhat more complex. Notwithstanding this, all were present and correct shortly before noon, and the decision made to ascend the tower, raise the bells ready for the peal  a brief practice on the handbells for those taking their place at the graveside, and then a very pleasant walk over the fields to the Pimlico Cemetery, accompanied by a small company of parishioners. Your writer, having arrived somewhat early at the church, had been able to view the interior in some depth. There are always tell-tale signs of a traditional parish  the BCP, Hymns A&M and the King James Bible  and here they all were. A fine old gentleman was busy in the chancel, and upon approaching him, I discovered this was the Rector of the parish  for the past 49 years! Standing and talking to Mr Williams, one became aware of the real liveliness of the church  plenty of music set out on the choir stalls for the very large choir, whose repertoire would put many a Cathedral to shame. The Electoral Roll, too is an awesome size for such a parish in these days. The Rector was very pleased to be able to welcome the Society to his Parish. Mr Game was astounded, upon arrival, to find that the Rector was still here  Mr Game was a member of the local band in the 1960s  so much nostalgia then ensued! Nutfield church is well worth a visit, both for its architecture, and as a living church showing forth all godly quietness. Back at the grave of Mr Burkin, and all the company assembled, a local representative stepped forward to read his tribute  a most interesting account of Mr Burkins life and achievements in the Parish of Nutfield, including his long tenure as sexton, and his conducting of peals at Nutfield, and other local churches. The speech given by the Master, Mr Colin Newman, which followed this contrasted perfectly, giving a very clear account (much of which was provided through the diligence of Society librarian, Mr A.J. 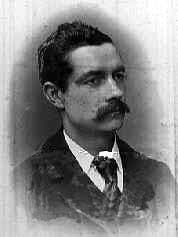 Phillips) of Mr Burkins considerable achievements and the good order he maintained during his Mastership of the ASCY. 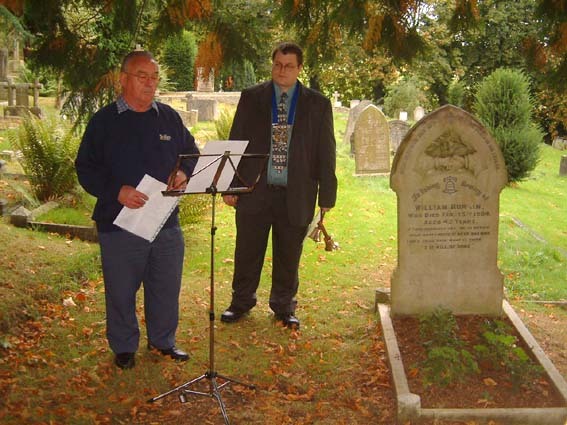 The Rector concluded these formalities with some well chosen prayers, and then a very pleasant plain course of Bob Major was rung on Handbells over the grave by The Master, Dickon Love, Richard Verrall and Michael Moreton. The company then adjourned to the "Queens Head" for refreshment and lunch. The beer and food in this establishment really is quite splendid, and two of the peal band had the audacity to choose quite the largest pork chops imaginable! Wholesome and nourishing food indeed, to add ballast for the peal attempt which was to ensue. Many questions were asked of the Society members by the local contingent, with regard to the current operation of the Society, and so the time spent in the hostelry proved invaluable in promoting the good name of the Society. The tower then ascended, and the bells tried out, the peal band went off into changes at a steady pace shortly before 3pm, while the villagers went on a walking tour of the parish, within sound of the bells. Nutfield T.B. was the first method of the seven chosen for this peal, and this was rung very creditably; next into Bourne, and then Ipswich  for those of us more used to ringing Surprise on twelve than six, all this was quite a challenge! How ironic then, that, having rung the less well known methods (to some), there should be a shift in course during the fourth extent  Wells - which brought the peal to an abrupt conclusion. The Master, who rang the tenor made an excellent job of conducting, and it was just a sorry thing that the peal concluded prematurely. However, of course, this is always the hazard of the job, and what makes peal ringing so much of an achievement. Finally, we descended the tower to partake of a delicious tea in the Church provided by the locals. More convivial chatter with the Rector, other members of the peal band and locals, until one by one the company broke up and made their way home. A peal lost, but new friends made, the ASCY promoted in the wider community, and a good day had by all. It seems, too, that another attempt will be made for the peal at the earliest opportunity. All best thanks must be tendered to the locals, the Rector, and to the Master, Mr C.G. Newman, for a well organised and enjoyable day.